From vintage to classic to trendy, there are so many ways to translate the nautical and beach vibes into your bridal shower celebration! 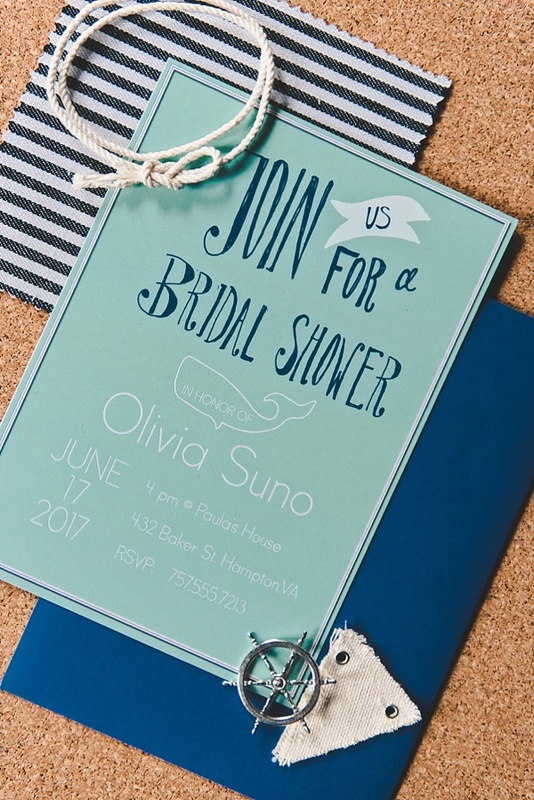 Thanks to Basic Invite, we have partnered up to share some of our personal coastal favorites and how you can customize and transform their beautiful bridal shower invitations for your theme! No matter your personal style, there's literally something for everyone. With Basic Invite's super user-friendly website, there are hundreds of customizing options with their collection of diverse fonts and colors -- that you choose and see change in live time. So whether you are organizing your party or your BFF is, at least one part of the planning process is easy! The most difficult thing you'll go through is deciding which one you like best, so to help you get started, we have six lovely coastal-lovin' designs to begin inspiring you! For the ladies (or gents!) 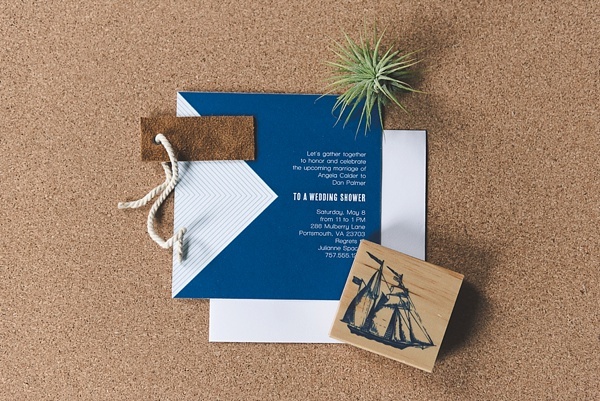 who love a design that is line- and color block-inspired, this wedding shower invitation gives a nod to a nautical flag while still staying fresh, fun, and of course, modern. Keep the white font color in there for a nice neutral and contrast, and it'll definitely be "Ahoy!" HOW I CUSTOMIZED: My favorite part about this design was it had a very nautical flag feel to it while bringing it into the modern realm of repeating lines. I changed the entire color scheme and the fonts to better suit my theme. The "To A Wedding Shower" phrase was customized in Basic Invite's font "Chi." -- get the goods --It's all about the mixing and matching patterns when it comes to style! This contemporary take on ocean waves with a simple seashell hits all the right notes when it comes to fashionable stationery. Pair it with some rose gold or copper decor at the actual wedding shower, and you've got something your guests will totally Instagram! Don't forget to add the hashtag on the invite! HOW I CUSTOMIZED: I wanted to modernize the overall feel of the original invitation, so I changed "bridal shower" to "wedding shower" and updated the "Wedding Shower" font to a more trendy hand-lettered font labeled "Hea." A little bit quirky, this playful bridal shower invitation is taking on the more casual aesthetic. 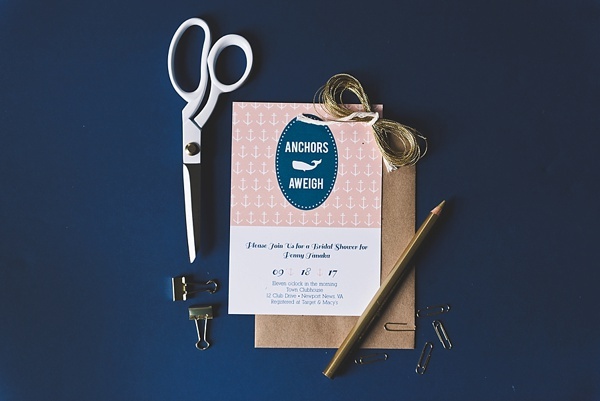 With a handwritten-like font and the cute whale symbol, you can take the nautical theme in a different direction. You can even change the color scheme to incorporate yellow or pink to still bring the ocean vibes! HOW I CUSTOMIZED: In order to make it a more fresh and clean design, I simplified a lot of the design elements (like the boxes and lines) to "blend in" with the minty background. This is probably one of my most favorite features about Basic Invite; the flexible creativity you can do with every single one was amazing! I also changed the background and font colors. Pink, anchors, and bold shapes, it's all about the prep with this one! The nautical theme lends itself to preppiness already, so give it a bridal touch through colors and font choice. 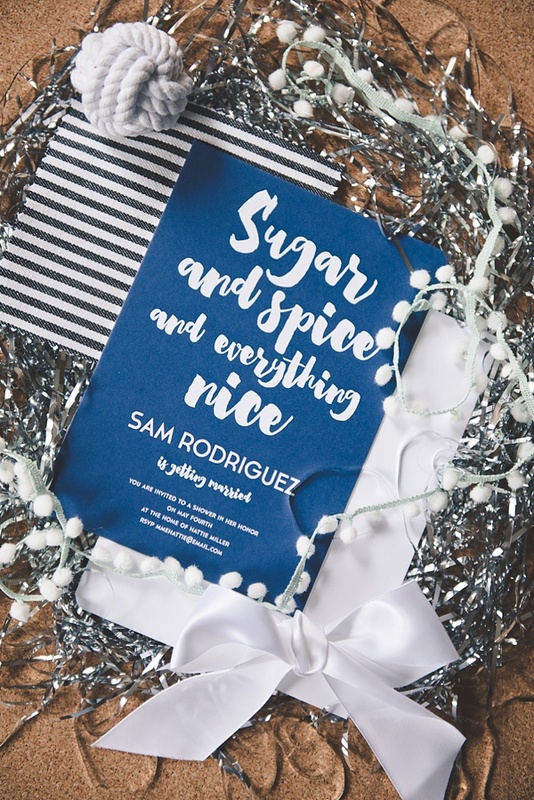 We think the cursive font and the white polka dot border around the oval is everything! HOW I CUSTOMIZED: The original is actually a baby shower invitation on Basic Invite's website! I thought it would be just as cute as a preppy bridal shower invite, so I didn't change much except swap out the wording and added a name. Sometimes all we need is a little sparkle. 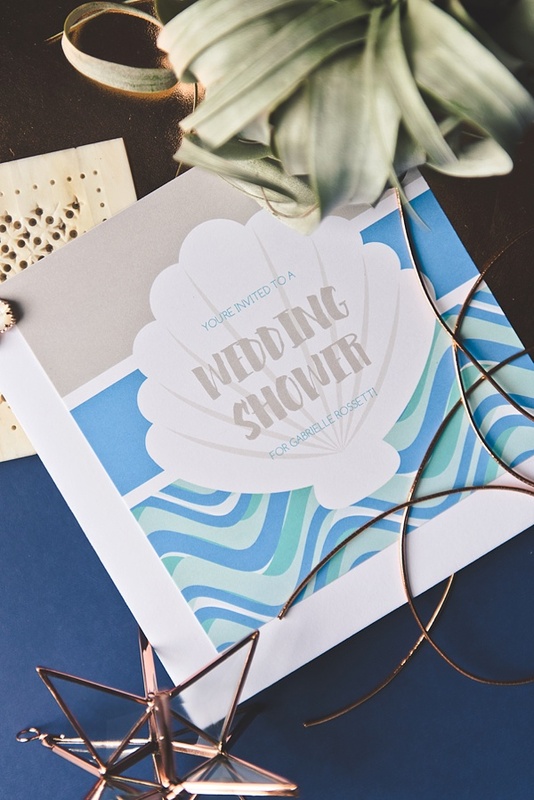 Keep your bridal shower invite simple with trendy hand-lettered fonts and add the glam through your shower decor. From bedazzled sunglasses, DIY nail polish stations, to metallic cake toppers, sky's the limit when it comes to adding the shimmer to your celebration. HOW I CUSTOMIZED: Yet another baby shower invite turned wedding! I updated the background to navy blue and changed the font color to make it more feminine and trendy. Romantic and timeless, this nod to the vintage and times gone by are made perfect with neutral colors, laurel illustrations, and classic fonts. 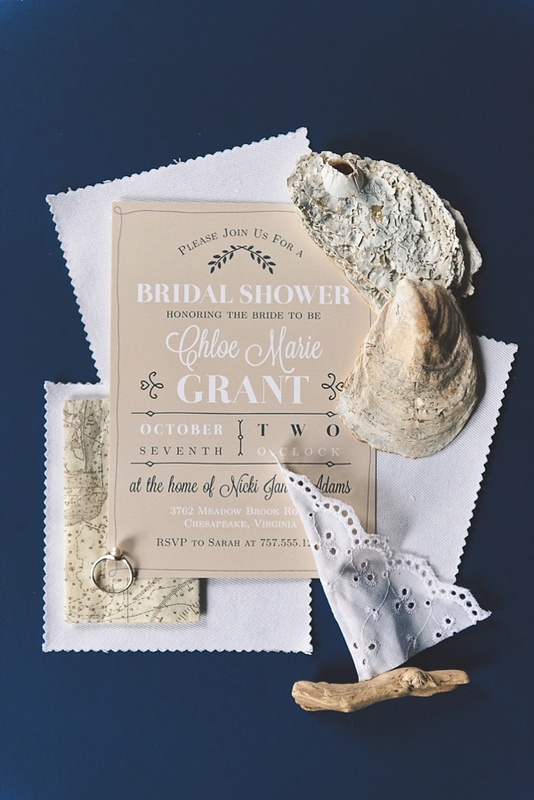 Add in more of the old world vibe by finding old nautical maps, oyster shells, and lace to help style the bridal event. HOW I CUSTOMIZED: This one actually got the biggest makeover from me! Originally a baby shower invitation, I updated the wording to be bridal-friendly and changed the background, font colors, and detail elements to be more neutral and vintage in theme. All photography and styling done by Chelsea LaVere. To get to know about more bridal shower invitation options from Basic Invite, head over to their website. Warning, you will get lost in all the creative options and likely will start dreaming of different color palettes and fonts galore!